Recently I had the opportunity to work with Jo Anne Wilson at the Interlochen Writers’ Retreat, and am overjoyed that she has agreed to be part of View From the Keyboard. A woman with many remarkable stories, Jo Anne is lucky to have writing (and arting) spaces in a couple of beautiful spots in the world. 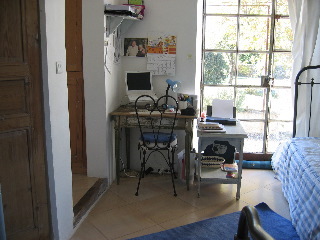 Here she tells us about her work spaces in Provence. That’s France, you know? 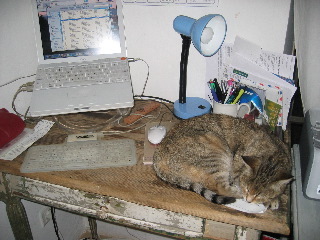 Jo Anne: During the first few years in Provence, my writing space was this old desk, located in a building that was once a small shed on a lavender farm. The shed is now a comfortable vacation house. From the window I could look out over the lavender fields. Often I had the company of one of the resident cats. During the months I spent here, I was inspired by the beauty of the fields and the sight of Mt. Ventoux beyond them. The quiet, country setting was really an inspiration to me. I often wrote in the morning, and then would head out for a walk among the lavender fields. Even in winter, the rows of plants have a purple green hue that speaks of the promise of blossoms to come. More recently, I spend my provençal months in the heart of a small village. The owner’s of the house restored an old ruin, and created a modern home. 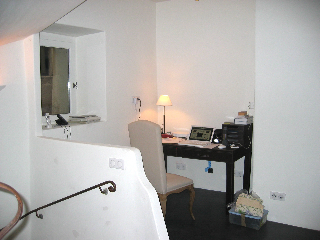 From the corner of the living area, I have a nice desk, my computer and printer, and all the conveniences of wifi. If I look out the window, I see red tiled rooftops all around me. This location is much less isolated than the lavender farm and, if I need a break or inspiration, I just walk up through the village to the local coffee shop/bakery and indulge in café au lait and a croissant. I had thought I was compiling a book of essays, working title: Letters From Provence. That may yet be the case, but in the course of summer workshops, I have found that I might be writing a memoir. I’ve spent most of the past eight years living in Provence. What I had thought would be somewhat factual, but interesting stories about markets, and people, and the weather, the food, and the wine…..is turning out to be more about me and how I’ve lived with all of these, and the ways in which they truly changed me as a person and how I live my life. I do have a website: www.meetmeinprovence.com I enjoy organizing trips to this region for individuals, families and small groups. I originally called them Creative Retreats and they started (as you will see on my website) primarily for artists and photographers. I have recently decided that the area is not only beautiful to see and paint and photograph, but is also inspiration for the writer’s spirit! The following piece was written from the village house writing corner. I live in the heart of a village in Provence. The village is perched, literally, on a rocky hillside, and water flows freely from the rocks. The minute I open a window or step outside, I hear water running. There’s a fountain in the tiny square outside the house: typical of several throughout the village. There’s the big fountain in the main square with its tall cement center column. At the top of the column are several spigots from which water falls into large clay flowerpots….no flowers, just water, tumbling and splashing. An old lavoire, a large tub like basin, sits opposite this fountain. The village women used to do their laundry here. Its wide cement edges are slightly slanted inward … convenient washboard for scrubbing clothes. The basin is fed from the rocky sources, and water splashes and gurgles continuously through it. Some village sounds change with the seasons. Summer tourists bring a hum of voices, in many languages. In the fall, children’s giggles drift upward as they head to the local school. In hunting season, hounds bay and bark in the distance, while their tell tale bells clank and clink as they roam the nearby fields and vineyards. Other village sounds continue no matter what the season. Doves chortle and coo on the red tiled rooftops. The Mistral whistles and wines its windy way around the corners of the houses. Church bells chime the hour, and the little fountain outside my door burbles on.